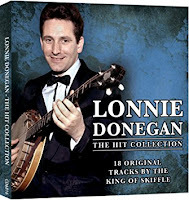 In North America, Lonnie Donegan is known for the 1961 top five hit Does Your Chewing Gum Lose Its Flavour On The Bedpost Over Night. The song is a staple on the Dr. Demento radio show. But in England, he was as important as Elvis Presley in popularizing Rock 'N' Roll. He was born Anthony James Donegan Apr. 29, 1931 in Bridgeton, Glasgow, Scotland but he grew up in East London. His father was a violinist. As a child, Donegan listened to swing and country and he taught himself to play guitar by listening to the radio. He played in London clubs when he was spotted by jazz musician Chris Barber. While a member of that band, he was drafted into the military in 1949. After his 1952 discharge, he started the Tony Donegan Jazzband. After opening for bluesman Lonnie Johnson, Donegan took the name Lonnie as a tribute. Then Donegan became a member of Ken Colyer's band. Then Donegan created "skiffle". This was a mix of the Dixieland jazz he was already playing augmented by banjo and other folk and country music instruments. He performed sped up versions of traditional folk songs like Rock Island Line which was a top ten hit in the US in 1954. Donegan signed with Pye Records in 1955 and that's when things started to pick up for Donegan. He became a big star in England but he was unable to get anywhere in the US until Dot Records picked up Does Your Chewing Gum Lose Its Flavour On The Bedpost Over Night. It was a hit in England in 1959. In 1961, it reached #5 on the Billboard Hot 100. The song dates back to the 20s. It was written as Does Your Spearmint Lose Its Flavour by famed bandleader Billy Rose along with Ernest Breuer and Jelly Roll Morton band member Marty Bloom. It was a hit at the time for The Happiness Boys. It was written as a novelty song but Donegan's skiffle version was a quicker tempo than the original. Donegan changed Spearmint to Chewing Gum for copyright reasons so the BBC would play the record. Donegan's career faded after that because of The British Invasion. But he made a big comeback in England in the 80s and he toured and recorded regularly until his death on Nov. 3, 2002 at age 71. Donegan had suffered several heart attacks since the 70s. This comp is a good intro to his music. Here's a video of Does Your Chewing Gum Lose Its Flavour On The Bedpost Over Night by Lonnie Donegan.